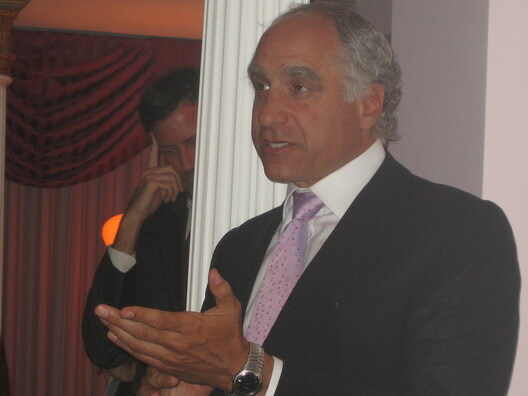 The Gowanus Lounge: Carroll Gardens Developer Addresses "the Scarano Issue"
Carroll Gardens Developer Addresses "the Scarano Issue"
You might recall that one of the issues connected to the building at 360 Smith Street in Carroll Gardens was the involvement of Robert Scarano as the architect. In fact, City Council Member Bill de Blasio had previously called on Billy Stein, the developer, to "end the curse of Scarano" and demanded his removal from the project because he was "a proven bad actor." Mr. Scarano's name was hardly mentioned for most of the Carroll Gardens Neighborhood Association meeting which Mr. Stein attended in Carroll Gardens Monday night, and the Council Member did not bring up the subject. After resident and blogger Katia Kelly asked about the architect, the developer spent some time addressing what he called "the Scarano issue." "I hate to be in a position of defending someone who has become so reviled in the community," Mr. Stein said, noting he has known the architect, who he referred to as "Bob," since the 1980s and that "people all over Brooklyn are living in Scarano Architects buildings." He said that Mr. Scarano had done some "questionable" things regarding the zoning code. He added that "complicit with the mistakes Scarano has made are the developers that ask for them." Mr. Stein is not the first person to make the case that the architect has been personally held responsible for things over which he has no control and which should logically be the responsibility of developers, contractors and the city's various regulatory systems. He argued that the press has attributed all problems at buildings designed by the architect to him personally, even being blaming for damaging a subway tunnel in Williamsburg at the troubled Modern project on N. 7th Street. "The architect doesn't do the excavation on the job," he said. "That was the contractor." He said that a New York City Transit official had told him he had advised the developer of the Modern not to hire the contractor that has run into problems at the site because "he was a cowboy." When the problems occurred, Mr. Scarano ended up being blamed, Mr. Stein said. Regardless, Mr. Stein said that he would hire an outside safety consultant to supervise the project. "I will not have Scarano responsible for anything that has to do with safety," he said. I'd like to see more balanced reports like this. Please keep it up. When a position doesn't pass the 'sniff test', responsibility should clearly be borne by both the architect and developer. When a '3 story' building clearly looks like a 6 story building, alarm bells should ring. The regulatory failures he cites, are incorrect as they were caused by Scarano's ability to self-certify, which have been revoked. Mr. Stein is doing the best job he can, defending someone who has caused untold harm to the industry, by being the most egregious culprit of advantage-taking and rule-bending. Total BS by Stein, not even the least bit surprising. And "knowing Bob since the '80's" doesn't make Bob any better. Just another scumbag developer using another scumbag architect. I was giving Stein points for meeting with the CGNA, but after defending Bob, back to zero. With the huge buzz here in Carroll Gardens of 360 Smith St., how come 100 Luquer has been ignored. Depending on what sites you check out on-line this building is going to be between 11-15 stories. And apparently, each floor is going to be big. With 4.5 floors done this building is nearly as tall as the 6 story building that is right next door(unless you go by the artist rendition, hah). Does you have an update on this?